Tile 101 > Can Tile Handle Life with My Kids and Pets? Can Tile Handle Life with My Kids and Pets? Tile is a great flooring option for families with children or pets. It can give you the gorgeous look of wood, natural stone and a myriad of other materials, but with incredible durability and cleanability. No matter how hard your family lives, a tile floor can take it. You’re probably hoping your floor can survive 18 or 20 years, just long enough to outlive Fido or to get the kids off and on their own. But think about it—many tile floors in Europe have lasted for several centuries. If they can survive hundreds of years in public buildings, tiles can probably handle your household for a few decades. And no other flooring cleans as easily as tile. Dirt, grease, spills and other “accidents” wipe right off, posing zero threat to the tile or to the subfloor below, and flooring tile with sealed grout is practically impervious to moisture, stains, scratches, scuffs and dents. Toys, dog and cat nails and even high heeled shoes can do a number on many other types of flooring, but unless your child or dog is Superman strong, he will be hard pressed to damage a tile floor. 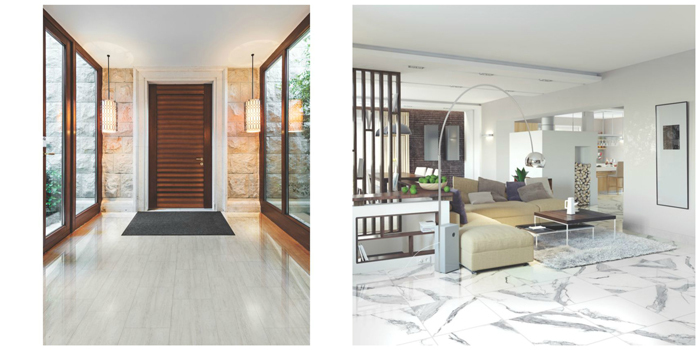 The hardness of tile is a great asset when it comes to maintenance and durability, but it can also be a drawback. If your baby is learning to walk, a tile floor is not the most forgiving surface, and if your pup isn’t allowed on the furniture, tile also doesn’t make for the most comfortable sleeping. Area rugs to the rescue! Well-placed rugs help define seating arrangements in large spaces, inject color and texture in a room, and most important to baby or Fido, they provide a nice soft landing. One blog post can’t answer every question you may have about tile, but it can arm you with some basic information that will help simplify your shopping experience. First, let’s talk ceramic vs. porcelain. Actually, the two are very similar. Both are made of similar materials. And—just to make things totally confusing—they both fall under the broader term of ceramics. The biggest difference is that porcelain tile is fired at higher temperatures, which makes the tiles denser and more impervious to water. This quality is especially important in outdoor applications where water could get into the tile, freeze, and cause the tiles to crack. The most important aspect is whether or not the tile is rated for floors. Some tile is created only for use on walls or countertops. Tile made specifically for walls is often less dense than flooring tile, so it can’t take the weight and abuse that flooring tile endures. Wall tile may also have high sheen glazes that would be too slippery to walk on or textures that would become trip hazards on the floor. Most flooring tile, however, can be installed on walls. If you love a flooring tile and want it to extend onto the walls, unless it is unusually heavy, it can likely be used on the walls as well. Most tile sold for use on floors will be durable enough to stand up to daily use in the average home. If you have a particularly active family and want a higher performing tile, look for the Visible Abrasion Classification. The Visible Abrasion Classification system ranks tiles 0 through V based on how well they stand up to abrasion (scrapes and scratches). Tiles with a rating of 0 should not be used on floors at all, and tile with a rating of I should only be used in spaces with light foot traffic. Tile with a rating of III will stand up to even the most abusive households—even if you live with Bamm-Bamm. Hopefully this information simplifies your shopping experience and boosts your buying confidence. With a few considerations and carefully placed area rugs, tile can be the perfect flooring choice for your entire family.